The Trust raises about 5000 plants each year in its own nursery from locally collected seeds. The planting of native trees and flaxes to provide sheltered breeding sites is one of the Trust’s most successful strategies. The Nursery operations are supervised by Louise Ashton. The nursery is a 100% community venture. Its sustainability depends on the generosity of benefactors and hundreds of volunteers who help to nurture the plants. From six to 10 are present any Wednesday, contributing their own garden skills and knowledge of native plants, and producing thousands of wire plant cages and pegs. The low annual rental of a ‘penny’ for the decommissioned Dunedin City Council sewerage works is helpful for the viability of the business unit. The nursery has traditionally run on a break-even basis, relying on donations from organisations and individuals. Since the 2008/2009 financial year the Trust was unable to secure sufficient sponsorships or grants to offset the operating costs, so plant production was significantly increased to 15,000 pa to enable the sale of plant stock to assist. 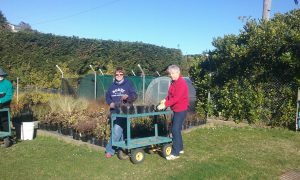 These sales assisted the nursery to remain a viable unit and a vital part of the Trust’s core operations until the devastating flood of 2015 and plant numbers are now reduced to 5000 pa.